I have too many projects going on right now. My mother has gone to assisted living and I'm clearing out her apartment. My mother in law passed away and I'll have to deal with her things next. Over the weekend I gave myself a break and worked on a couple of small projects. One of them was creating a watermark for my blog photos so that they look more professional and if anyone pins anything there's the name of the blog right on the photo. Oh how I wish I'd been doing this all along. It's a pretty easy process if you have photographs you want to make sure are credited to you. Here's the tutorial on Picmonkey: Tutorial: How To Claim Your Artistry by Adding a Watermark. 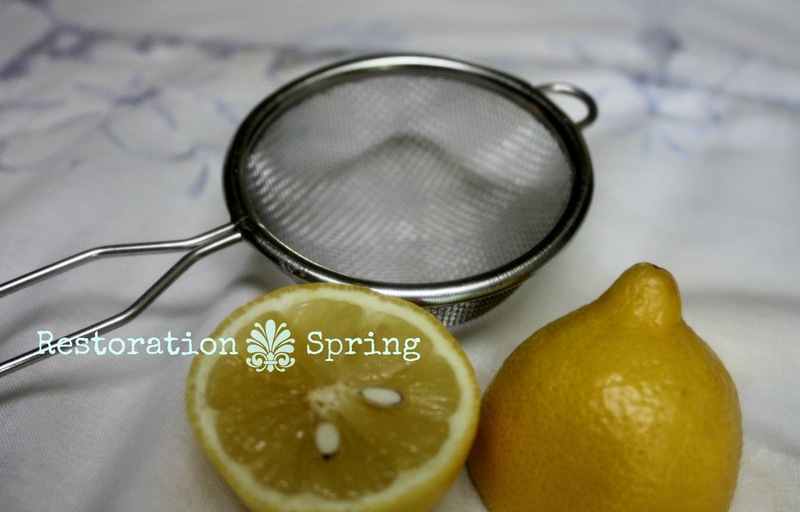 Picmonkey is the site I use for all those before and after shots. It's super easy to create a collage and you can edit the photos before or after. 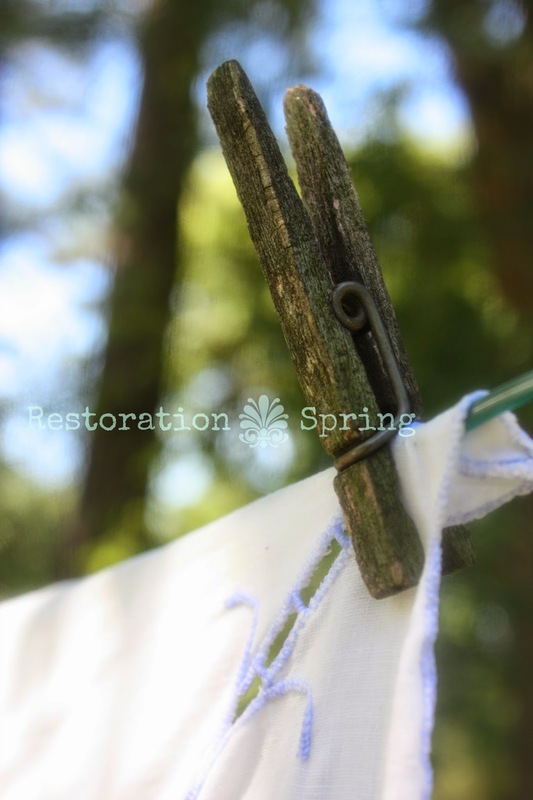 Several years ago a woman in an antique store told me that lemon juice and bright sunlight was the way to remove stains from vintage linens. Recently while purging I found an opportunity to test out that method. 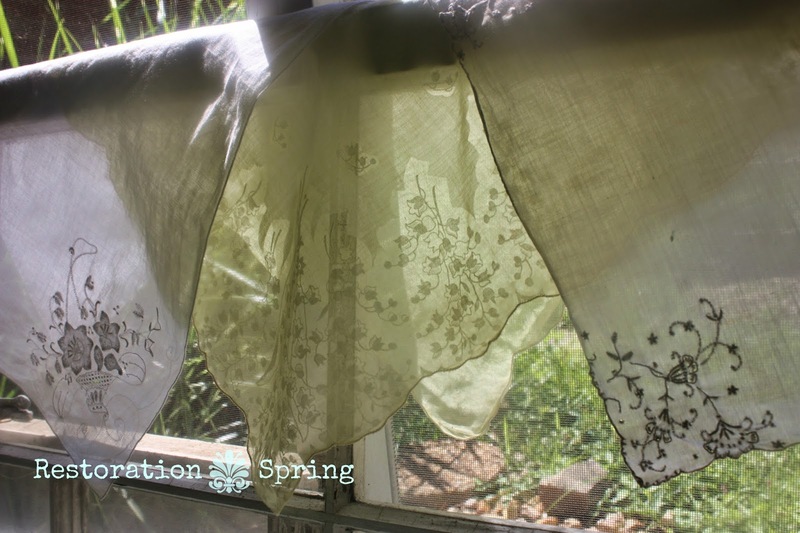 I had a couple of vintage tablecloths with stains. Stains that were probably 50 years old...at least. One was my grandmother's and is a fun example of mid-century color. The other I inherited from a relative when it didn't sell with her estate. It charmed me so I've kept it until now. 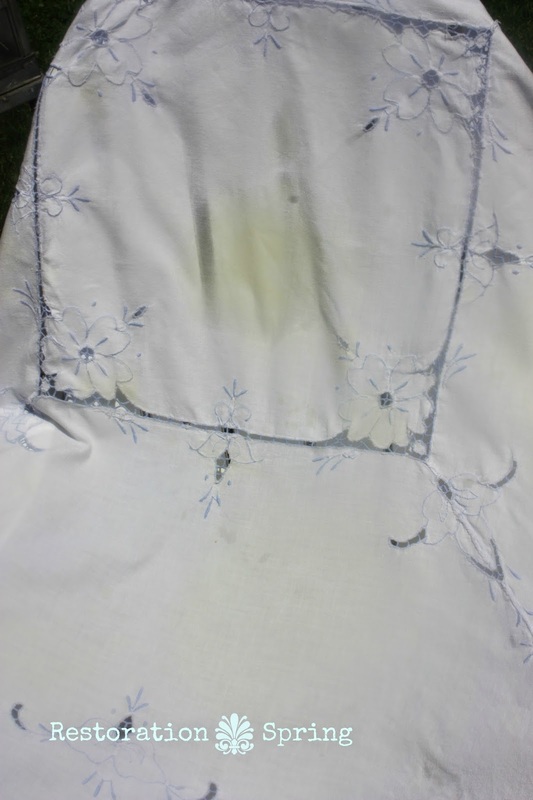 I wanted the lemon juice to work, but I was sure I could still see the stains. Though the sun was so blinding against all that white it was hard to be sure. I resorted to bleach in a spray bottle and attacked the stains again. After rinsing they seemed to be gone. 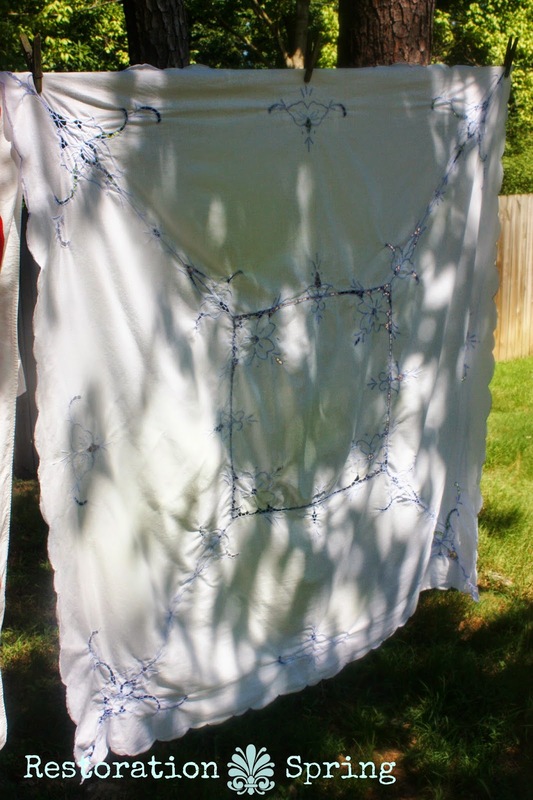 There are several ways to remove stains and frankly bleach is probably the harshest choice. Other people swear by Oxi-clean, peroxide, and original Dawn dishwashing liquid. 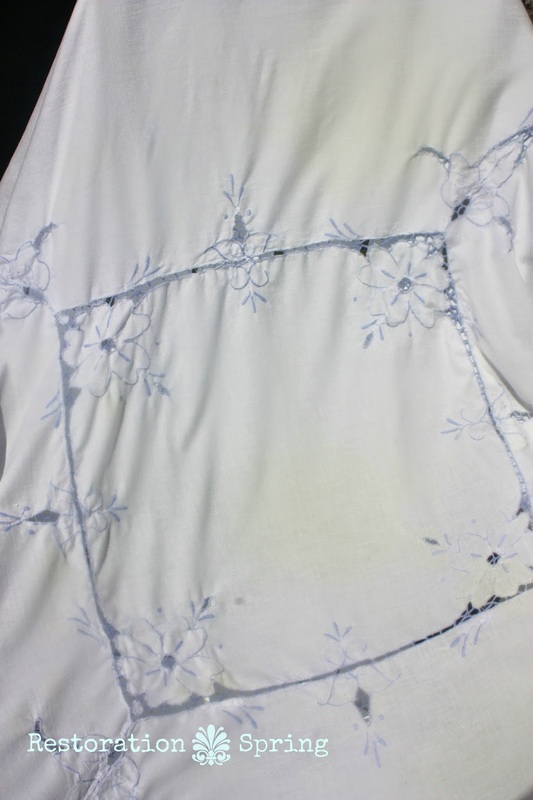 Do you see the stain in the photos below? 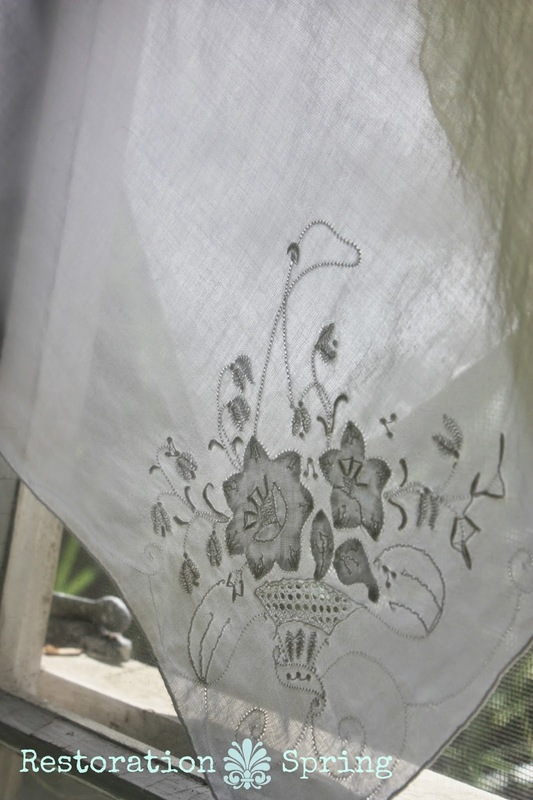 When I finished the tablecloths I pressed 3 vintage handkerchiefs with lovely details. I'm usually a big picture person and want to redecorate a room or paint a piece of furniture. Caring for tiny delicate things is comforting in its own way though. 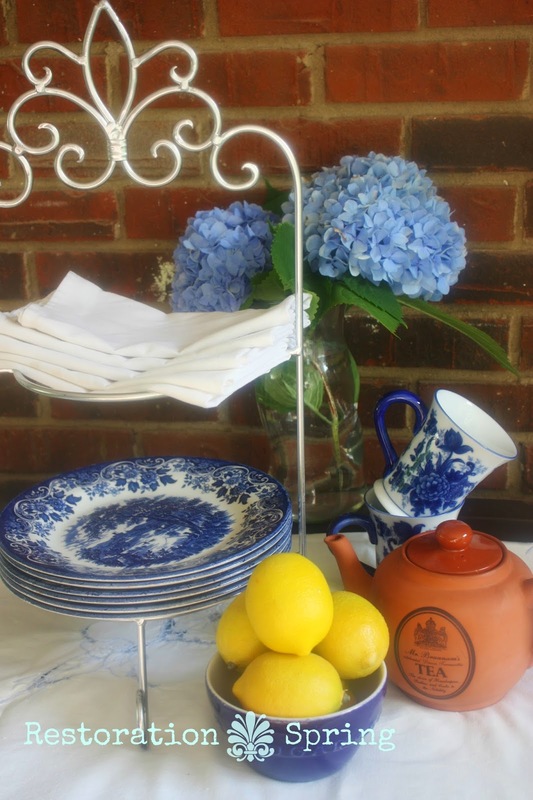 There is something especially sweet about real handkerchiefs. You can tell from these photos that I'm still trying to get the hang of making that watermark a uniform size. Here's the tablecloth amid several things I have for sale right now. 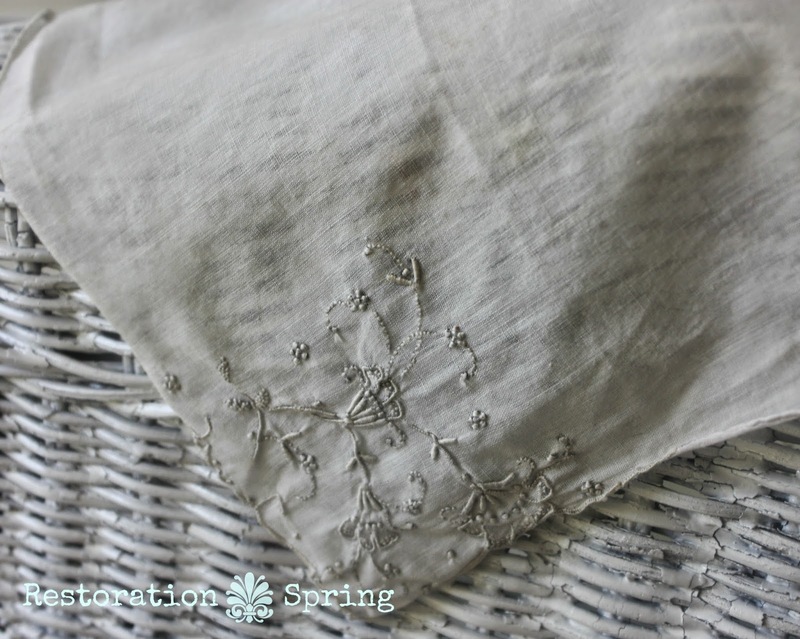 Have you saved an old tablecloth or other vintage linens? What technique worked for you? Well done for saving it! These are such gorgeous pieces.